While Cartier has recently placed its bets on more affordable classics like the steel Tank Americaine, the jeweller is still growing its Fine Watchmaking collection, albeit more selectively. In the lead-up to SIHH 2018, Cartier has unveiled two “mysterious” complicated watches: the Rotonde de Cartier Skeleton Mysterious Double Tourbillon and the Rotonde de Cartier Mysterious Day & Night. Both draw inspiration from its early 20th century mystery clocks produced in collaboration with Maurice Couët, which had hands mounted on sapphire discs, leaving them seemingly disconnected from the clock movement. 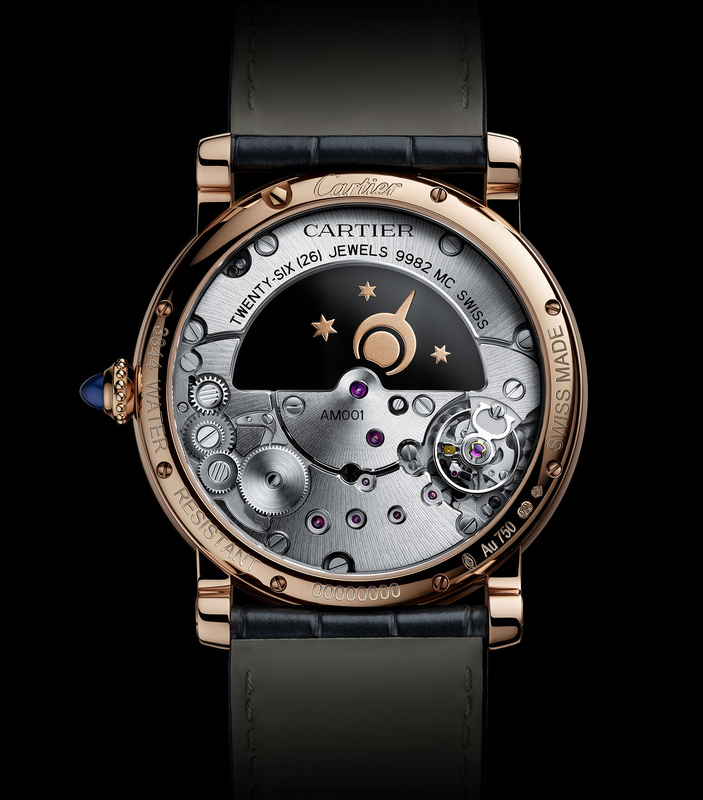 And like much of the rest of Cartier’s complicated watches, the movements are the brainchild of Carole Forestier, the talented head of development at Cartier’s Swiss watch headquarters. 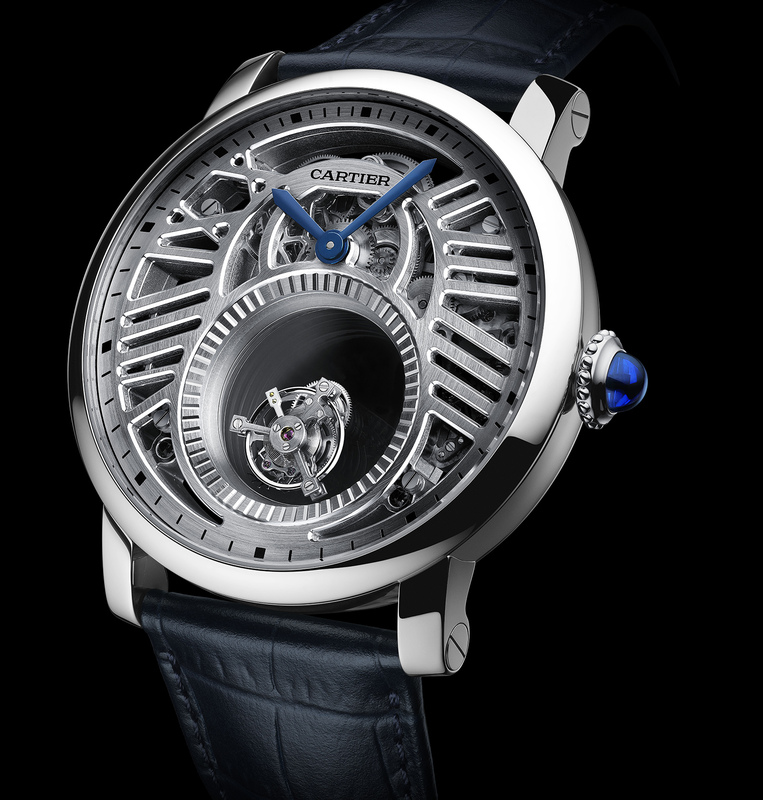 The Rotonde de Cartier Skeleton Mysterious Double Tourbillon Watch is the open-worked version of a watch unveiled in 2013, which has a double axis tourbillon rotating in an oculus without any visible support. Just like Cartier’s original mystery clocks, the Skeleton Mysterious Double Tourbillon operates on same principle of a sapphire disc fitted with a toothed rim that meshes with the gears of the movement, hidden within the chapter ring of the dial. The tourbillon cage itself makes one revolution per minute while the sapphire disc, on which the cage is mounted, rotates once every five minutes – hence the double axes. It’s powered by Cartier’s in-house cal. 9465MC, a hand-wound calibre with a 52-hour power reserve. The movement’s bridges have been skeletonised to form the shape of outsized Roman numerals, a signature design flourish of Cartier’s high-end timepieces, offering a glimpse of its mysterious gear work and amplifying the airiness of the whole watch. Limited to 30 pieces, the Rotonde de Cartier Skeleton Mysterious Double Tourbillon has a platinum case that measures 45mm and bears the Poinçon de Genève hallmark. It will be priced at US$216,000. Less complicated but more whimsical, the Rotonde de Cartier Mysterious Day & Night combines a “mysterious” movement with a day and night indicator. With the dial split in two halves horizontally – hours above and minutes below – it features a radial guilloche centre surrounded by a brown satin sunburst chapter ring. 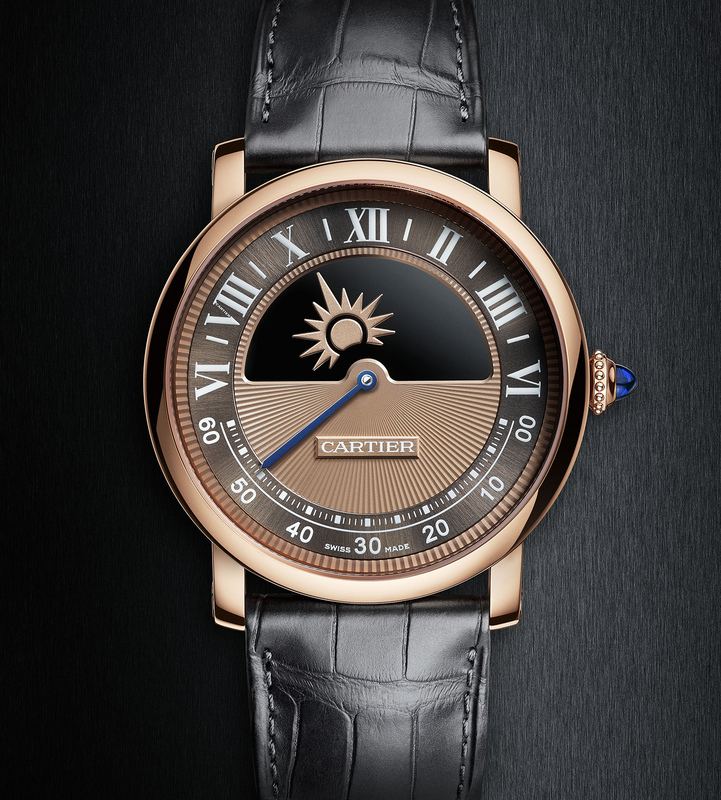 Inspired by Cartier’s comet clocks of the 1920s, the hour indicator is a clear sapphire disc with a Sun and Moon, each pointing to the current hour during day and night time respectively. Minutes are indicated with a blued steel sword-shaped, retrograde hand that travels from zero to “60” before jumping back to its origin and starting over. Available in white or pink gold, the case measures 40mm in diameter. 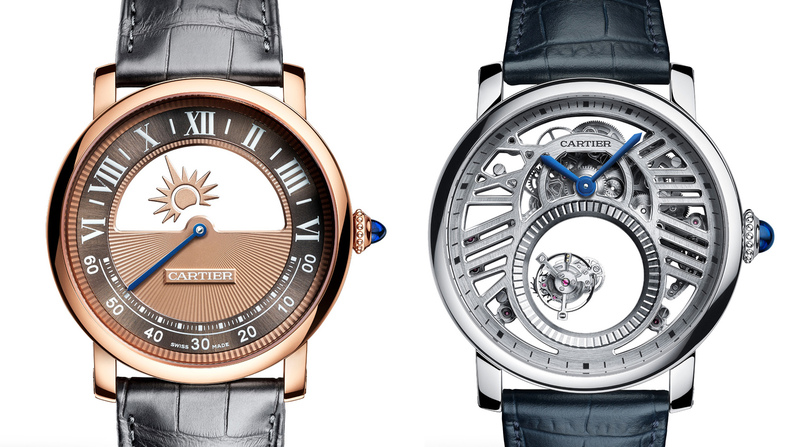 The Rotonde de Cartier Mysterious Day & Night is powered by the newly developed, in-house cal. 9982 MC. It’s hand-wound, being made up of 174 components, and offers a 48-hour power reserve. The price tag will be US$63,000.